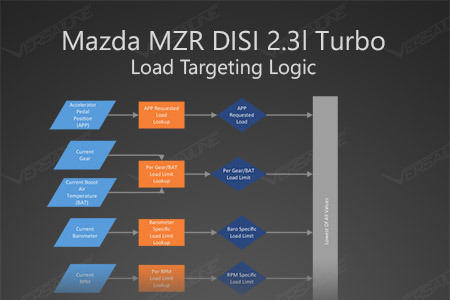 Over the years, I've answered quite a few questions on how exactly the Mazda MZR DISI 2.3l Turbo load targeting logic works. So, I thought I'd take some time to put together a clear diagram showing the load targeting logic. For those used to simpler but less consistent boost targeting, this may be helpful when converting to a load based tune. The Mazda MZR DISI 2.3l turbo engine was never released in a flex-fuel configuration. Due to lower cost at the pump and an R+M/2 octane rating of 95-97, there is a great desire to run E85 fuel in high performance turbocharged engines. Unfortunately, E85 fuel has a significantly different ideal air/fuel ratio than gasoline. 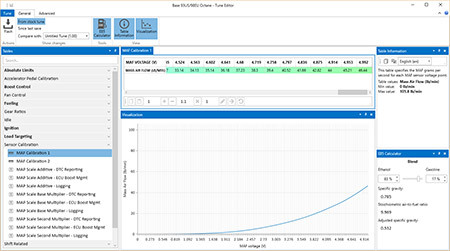 As a result, you can not run pure E85 fuel without modifying the fuel calculations, air fuel ratio targets and timing in the ECU. This guide will describe how to use VersaTuner to tune your Mazda vehicle for use with E85 fuel. 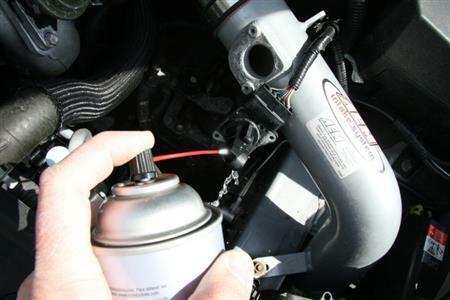 Mass airflow (MAF) sensor is a crucial component of your car. It reports the mass of air that has entered the engine. Engine control unit uses this information to calculate the amount of fuel that needs to be injected. As the MAF sensor is exposed to the airflow in your intake, it can eventually get contaminated and hamper the engine's performance. Find out how to clean the MAF sensor and keep it in good shape.